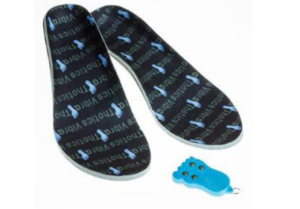 SENSOLE are vibrating soles intended for the improvement of the posture of walking and thus the balance. They are equipped with vibrators, thick of some millimetres, autonomous in energy and are tele commanded at distance. HEXABIO is a French company from PESSAC, next to BORDEAUX, specialized in orthopaedic medical material. The pilot was done in an Elderly Residence from CENON, Nouvelle Aquitaine, France. Four elderlies participated and they were accompanied by 2 physiotherapists. 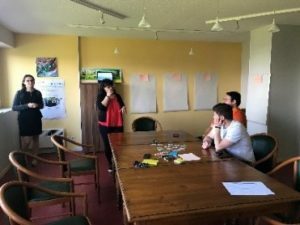 The 22th May 2018, we organised the first workshop (Focus group) with the physiotherapists. We wanted to talk with them about “ageing well”, work with materials and the relationship with elderly. The idea was to detect whether and how the soles could modify (for the best or not) their professional activities. At the end, we presented the soles and their functions. During 3 weeks, the elderly could use the soles as they want with their physiotherapist. After one week and a half, we did individual interviews thanks to questionnaires with elderly and physiotherapists to have their feedbacks. 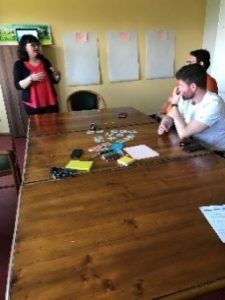 The 12th of June 2018, we held a second workshop with physiotherapists to discuss about their experience of using the soles. 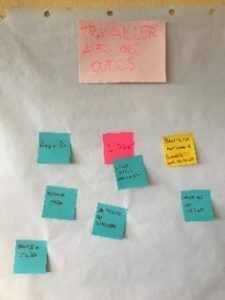 We worked on what they like, dislike and which improvement they can suggest. At the end of the pilot, we did a video interview of the elderly residence Director.